The UA Disc Plate Pulverizers will efficiently reduce 1/4″ material to -150 mesh at rates ranging from 50 to 200 lbs./hour. The UA Pulverizer is v-belt driven and operates at 900 RPM’s. They are furnished with a set of standard iron alloy grinding plates (255 Brinell Hardness) and in a variety of motor configurations to meet most demanding laboratory applications. Other grinding plates are available in materials such as Low Phosphorous Carbon Steel, Manganese Steel, Chrome Alloy and Alumina Ceramic. Thermal relays are supplied for 220 volt operation unless otherwise specified. A safety guard is supplied. The UA is ideal for grinding operations where -6.3 mm material needs to be reduced to 100 microns. Depending upon the hardness and friability of the material, the grinding rate will range from 50 pounds per hour, for very hard material, to 200 pounds for soft limestone. If contamination from iron is to be avoided, the ceramic plates are recommended (010F-092, 010F-093). This unit has been specially designed to work with UA Pulverizers. 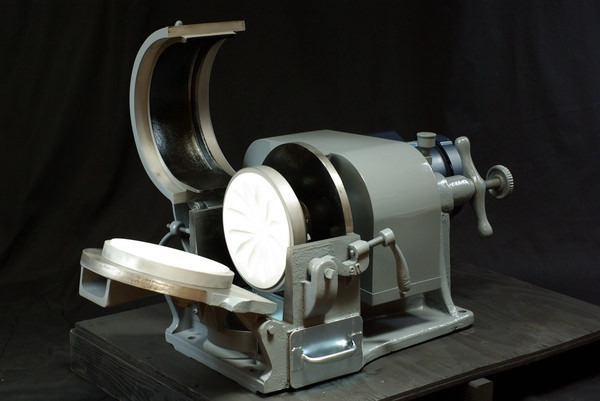 With it’s downdraft design and enclosed work space, it removes dust from the grinding operation. Easy to change filter elements keep operator attention to a minimum.